My sister recently made a joke about the recession leading to a zombie apocalypse, which I figured was just some college kid joke, but then I was reading this Ravelry thread (“Will Your Stash Outlast the Recession?“) and I noticed that other people seem to associate the recession with a zombie apocalypse. I’m not sure what zombies have to do with what New York Magazine is calling The Greatest Depression, but there you go. Anyway, whether the zombies do or do not arrive, I am stashing up while we are still zombie-free, in order to have yarn to last me through the recession. Aren’t these colors beautiful? I picked them out at Purl, three skeins of Canopy from The Fibre Company, but they were a gift from Adam. 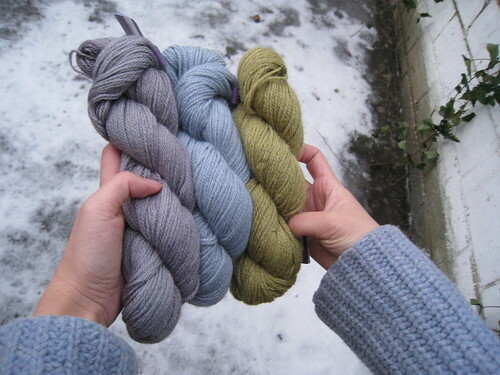 I recently discovered Zeitgeist Yarns, the beautiful blog of Kate Gagnon, one of the women behind Kelbourne Woolens, which distributes yarn for The Fibre Company. I want to make all of her patterns, and I grabbed a skein of white Noro on sale at the Point, (also a gift from Adam, who was combining birthday shopping with pity buying for me, I think) for her striped silk kerchief pattern. New York Magazine has an interesting article this week about the state of retail in the city, and how everyone is cutting back. They came to a lot of the same conclusions I did about yarn stores last week–lower profit margins and higher volume is the new formula for profit (ie sales), better customer service, and even after all that, inevitable closings of favorite stores. (I am kind of lured by the idea of going to Italy though, where a small town will be having a non-stop film festival with Mondo Kim’s videos. How Cinema Paradiso is that?) Yarn is even more of a luxury item than many of these other goods, but it is, relatively speaking, inexpensive, so people might hold on and keep buying yarn even as the economy keeps sliding. 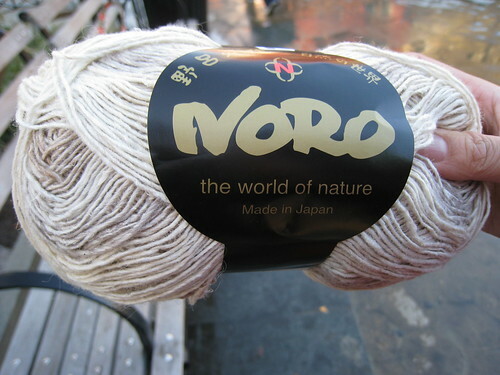 I’m not sure what will happen, especially on the wholesale side–will entire yarn lines disappear? If you have noticed any closings or changes at your LYS, leave me a comment, I would love to hear what’s happening in your part of the country. Posted in the Business, Uncategorized, Yarn at February 10th, 2009.